(ANS – Bruxelles) – On 28th June under the title ‘Is Europe doing enough to protect fundamental rights?’ the European Union Agency for Fundamental Rights (FRA) hosted a high-level symposium in cooperation with the Maltese Presidency of the Council of the EU. The symposium addressed the three most burning issues on the EU’s policy agenda by focusing on migration and asylum, insecurity and fear, and poverty and social exclusion. Particular attention was paid to the children’s perspective, and children themselves took part in the event as speakers and commentators. Among the young people, taking part in the Symposium was Junior, one young person living in Ireland accompanied by Bernard Verbeek, one Social Care Worker from Don Bosco Care Ireland, the Don Bosco House that he attends. 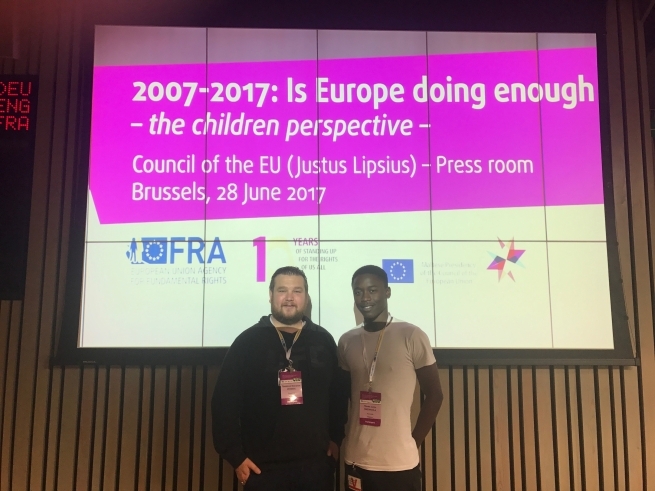 Thanks to the mediation of Don Bosco International and Eurochild, the voices of Junior and other 16 children and youth from several countries were listened and a frank open dialogue was established. H.E. Marie Louise Coleiro Preca, President of the Republic of Malta, delivered a very motivating and inspiring keynote speech, very much in line with the Salesian principles, insisting of the progress that Fundamental Rights Agency has brought to Member States, as for example to Malta. Indeed, many stakeholders highlighted during the event, the great performance of the Maltese Presidency of the EU, that ends as of 30th June. Her intervention was followed by the presentation of Fundamental Rights Report 2017 by Michael O’Flaherty, director of the Agency. In addition, two panel discussions on migrant children and child poverty were held, with various experts from Institutions and Civil Society. In addition, FRA’s annual flagship Fundamental Rights Report and Opinions, are now available in all EU languages, were presented at the symposium, and together the Agency’s new report on the detention of child migrants will form the backdrop to the discussions.